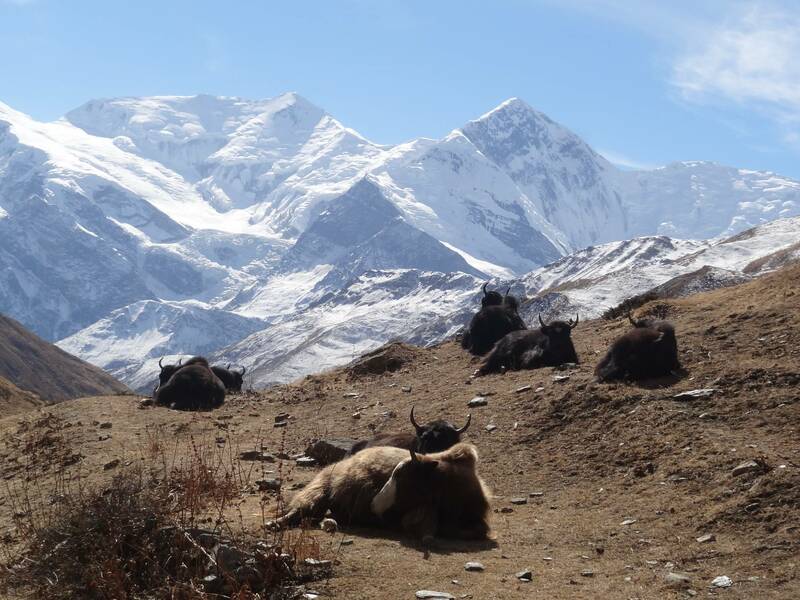 The Annapurna Circuit is one of the most popular trekking routes in Nepal. This is the region's classic long- distance trek for which you’ll need a full 2 weeks. 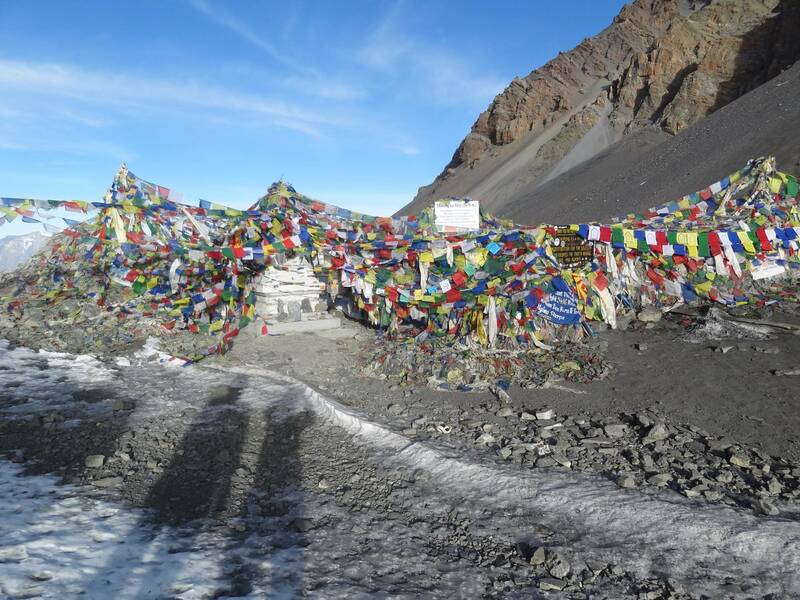 The route follows two river valleys, Marshyangdi and Kaligandaki, crossing between them over the Thorong-La Pass, at 5416m, the highest elevation in this journey. 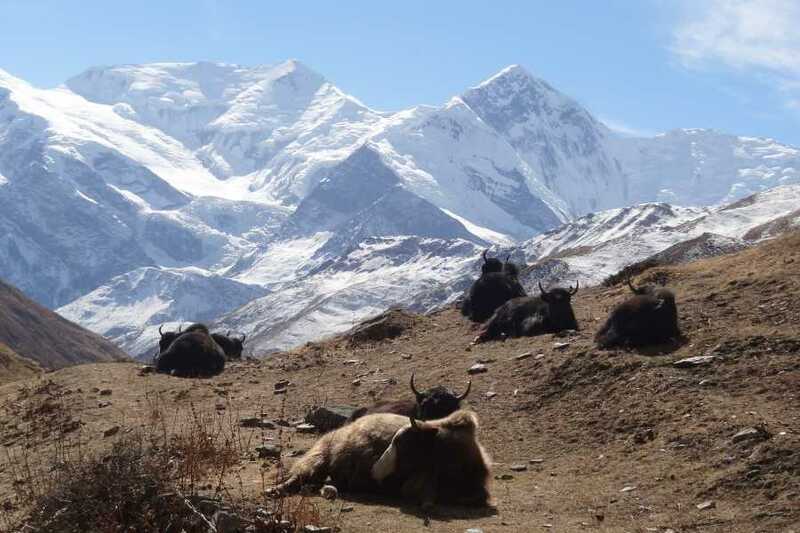 During the trek you will see many Himalayan peaks ranging in height from 6000- 8167m (Dhaulagiri) and will pass through villages of different tribes- Gurung, Brahman, Chhetri, Thakali, Tamang- learning something of their culture.The popularity of the Annapurna region is entirely understandable; being amongst some of the most dramatic scenery in the world there are trekking routes to suit all seasons and levels of fitness. The best seasons for doing this trek are October to December and mid-March to May. Have a look at the itinerary below or, please download the itinerary with inclusions and exclusions using the PDF download link to the right. If you have any questions or, need some customizations for your trip just drop us a mail or give a call! Our guide will come to pick up at the your hotel about 7 AM in the morning then we drive along the Kathmandu-Pokhara highway to Dumre and then follow the narrow and paved road by the Marsyangdi River to Besi Sahar, From here we will see some of mountain peaks, natural sceneries surrounding the valley and the daily activities of local people. Dinner and overnight at tea house in Bulbule. After having breakfast at the lodge we depart our trekking and the trail goes flat for the first part then climbs steeply and the path is cut into the sheer cliff-face some 200-300m above the riverbed. Eventually we descend to the stone village of Jagat (1330m.) 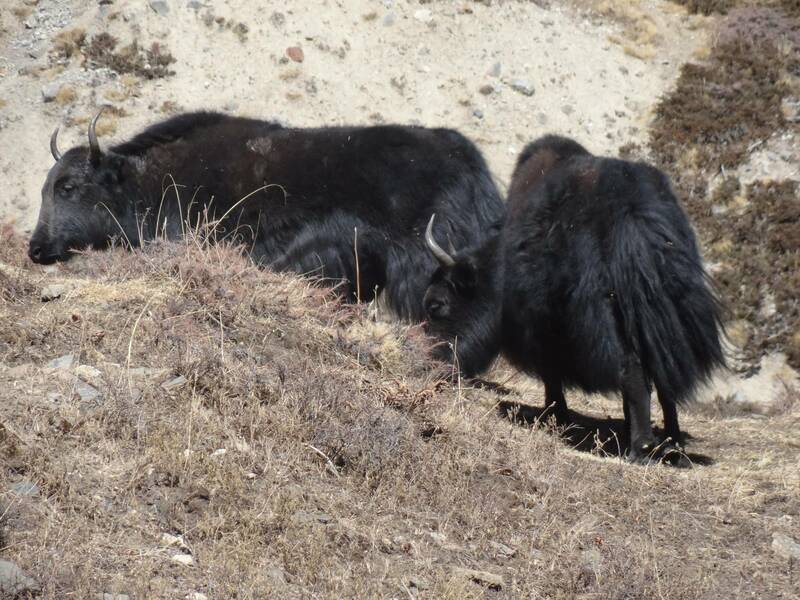 situated on a shelf which juts into the precipitous Marsyangdi valley. Now the trail begins to observe small ups and down to Chamje through the forests. Dinner and overnight at tea house in Chamje. We start our trekking with descending to the river and cross another suspension bridge; we begin a climb to Sattale (1550m.) on a path so steep that it seems one slip would send you hurtling down into the valley. We continue on an undulating path above the river, and at one point, where a tributary flows in from the opposite bank, the main river becomes covered with huge boulders that hide the water. Climbing the zigzag path to the top of the hill, we will see the level, plain of Tal (1700m.). Beyond Tal, the valley narrows and the path becomes high and winding, and in several areas hewn from the rock itself. Beyond the small village of Karte (1900m. ), there is a bit more cliff-walking before the path drops again to the river and we cross a another suspension bridge and arrive Dharapani. Dinner and overnight at Dharapani. 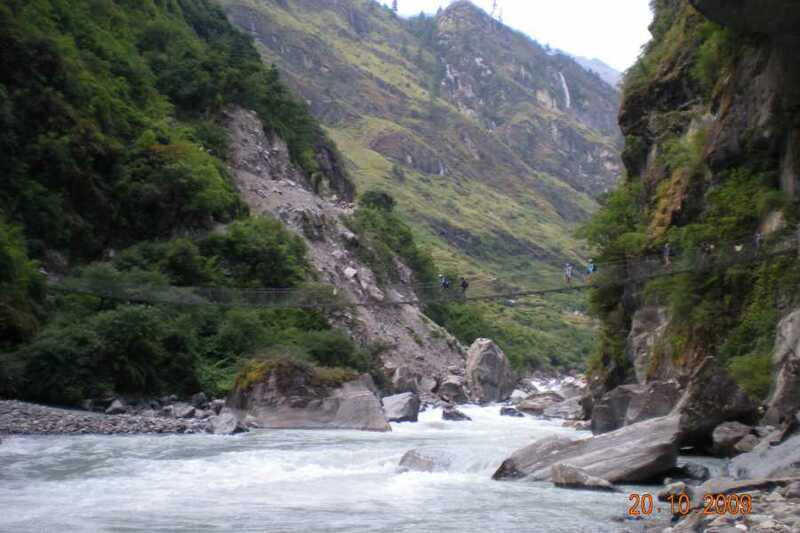 We will start our trekking with narrow field from the village, the Dudh Khola, which originates from the south face of Manaslu. 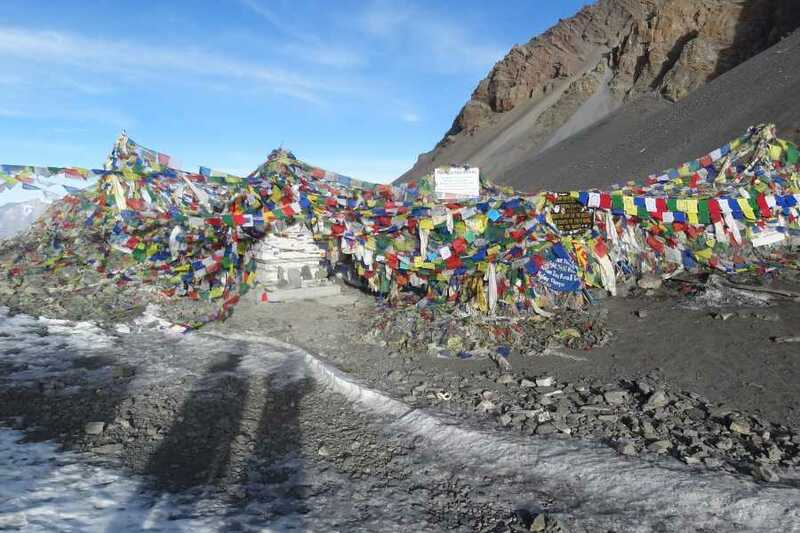 The Marsyangdi River then veers to the left, and as Annapurna II becomes visible ahead, you arrive at Bagarchhap, a Bhote village with prayer flags fluttering in the breeze around Buddhist monastery. Continuing to climb through forests of pine and oak, we pass through Danaque (2210m.). 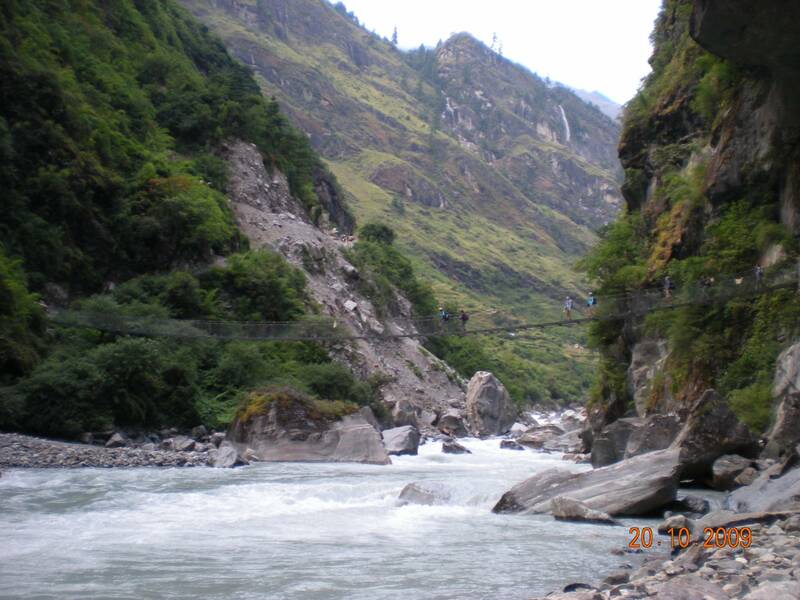 There comes a small wooden bridge which takes us to follow steep ascent path up to Timang village which lies at the bottom of Lamajung Himal then the trail goes through flat level until we reach Chame. Dinner and overnight at tea house in Chame. We start our trekking With Lamjung Himal (6893m) dazzling in the morning sun, we set off for Pisang. The mountain disappears as we climb the path up the valley, passing a huge apple orchard. We continue through a fir and pine forest, climbing to a high, rocky area as the opposite bank becomes an impassable cliff. From this point the valley becomes extremely steep-sided as we follow the path to Bhratang (2950m.) then a short climb from the village brings us to a rock-strewn area where we cross a wooden bridge and follow a high, winding path, before crossing back to the right bank again. We now trek through a pine forest and as the forest ends, the valley changes from a V-shape to a gentle U-shape, opening up a wonderful vistas the we come to a long mani wall by a bridge and the lower village of Pisang. Dinner and overnight at tea house in Pisang. Dinner and overnight at tea house in Manang. 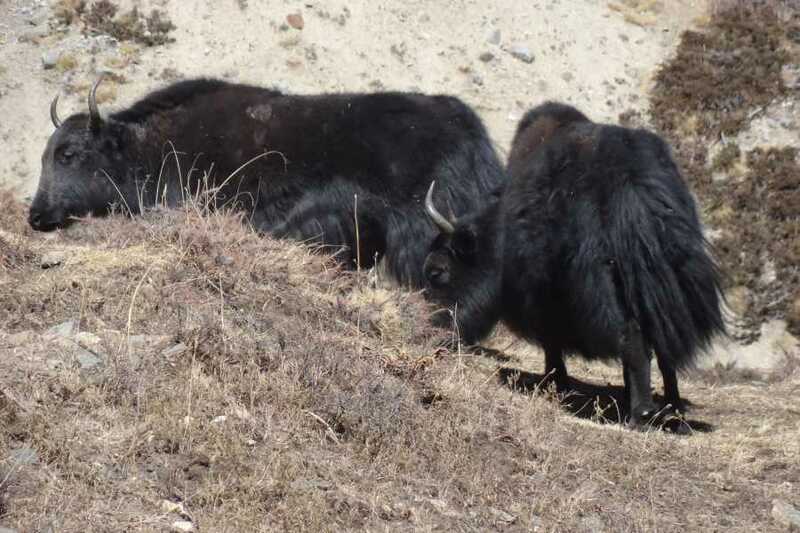 Dinner and overnight at tea house in Yak Kharka. Dinner and overnight at tea house in Thorang Phedi. Dinner and overnight at tea house in Muktinath. This morning, we will go visit the famous temple of Muktinath and return to the lodge then have breakfast and begin the trek descent down the dramatic Kali Gandaki Gorge, initially through arid country in the same geographical and climatic zone as Tibet. After passing through Jharkot and Khingar villages with typical Tibetan architecture, we follow path steeply down to Kagbeni, a primitive village famous for Tibetan architectures and there is a monastery hereabouts said to have been built in the 15th Century the Kagbeni is the border for Upper Mustang, check into the Guest house, overnight at Guest house. Dinner and overnight at tea house in Kagbeni. 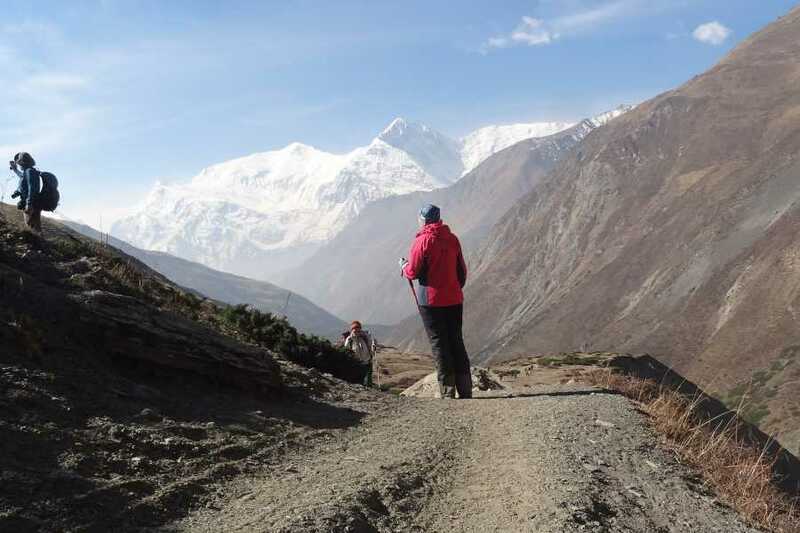 After having breakfast at lodge, we start our trek to Jomsom and it will be a short trek for about 3 hours to Jomsom. The rest of the day is free. Dinner and overnight at tea house in Jomsom. Today we fly to Pokhara, the lake city on the earliest possible flight. After checking-in at our hotel, we may take a rest or visit the Lakeside area in the vicinity of the Fewa Lake. Here, we can indulge in buying some souvenirs or sampling some local delicacies. Dinner and overnight at hotel in Pokhara. We take tourist bus at 7 AM to drive to Kathmandu and the driving will be fantastic along with many towns and we are able to see the settlements, Rivers, terraces and landscapes, after 6 hours driving we will arrive Kathmandu and overnight at Hotel.